Sometimes the collective unconscious speaks for you. Sometimes you speak for the collective unconscious. Case and point: as I write this, “Black and White” started playing on the radio. In 2009 I was set on covering some Michael Jackson songs. Gina and I had been talking about it for a while for Arcati Crisis, and I finally ordered his “Best of” sheet music book at the end of 2008 and got to work. It turns out, I wasn’t the only one set on covering him. First, Kris Allen broke away from the pack on American Idol with an acoustic “Man in the Mirror” – my first choice of covers – in the semi-finals. A few weeks later, American Idol’s first finalist round was – yes, Michael Jackson songs. Heading into a summer free for playing open mics, I decided maybe I did want to have some MJ songs in my repertoire, Idol-be-damned. I started learning “Man on the Mirror,” per my original plan. That week, Michael Jackson passed away. That is how I found myself on my blog, broadcasting a video concert for a bunch of strangers, playing “Man in the Mirror” and crying. 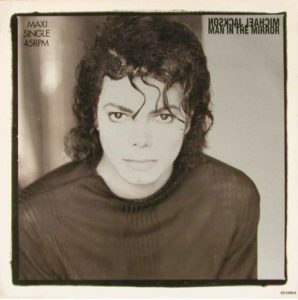 I’ve already covered the writing of “Man in the Mirror” – how the song many people most-strongly associate with Michael Jackson didn’t come from his own pen (which was unusual, for his 80s work). What I didn’t discuss there is how such an obvious, plaintive song got so dressed up in the excesses of the period, and of MJ himself. The song is so very simple. It took me a while to carve that out of all of the suspended, inverted chords in the sheet music book. First, it’s really just A-B-A-B-B1 – verse/chorus plus a key change. The verse simply descends a scale, while the prechorus walks up from root, to third, to fourth. The chorus pushes the ascent up to the fifth, but inserts a bit of tension by hitting a diminished fifth on the final pass to lead to a seventh – yielding an even strong resolve when we return to the verse. I get those numbers and relationships fixed in my brain quickly when I’m prepping to play my cover, but they all go by the wayside with a single listen to the actual track. There’s the haunting keyboard melody at the start, which keens through the first verse until the more active arrangement begins. Then, once the key change chorus is through, the band vamps for a seeming eternity while Michael regurgitates key lyrics in two- and three-word clumps. I don’t love the song as much now that I know it’s skeletal structure. Or, more accurately, I don’t love the Jackson version. It did use to seem like a perfect theme song for him, but now it feels excessive (which, maybe makes it an even better theme-song? I’m not sure). I much prefer strumming my way through it or, in a pinch, listening to Kris Allen’s version from Idol.